Ireland hasn't changed much since I was last here in 1969. The scenery is still beautiful, the people friendly, the music lively, and driving is as harrowing as ever. What has changed is the food. In 1969 it was fish and chips and overcooked meat. Last August my wife, Katherine, and I spent two and a half weeks driving along the Wild Atlantic Way, the road that winds along the west coast, eating the freshest seafood I have ever had. Almost every day we ate oysters, mussels, crab claws, scallops, prawns and fish that had been in the sea just a few hours before. Ireland has enthusiastically embraced the locavore revolution. Throughout most of the country, fresh local produce, meat and seafood can be found close by, especially along the west coast starting in the foodie epicenter of Cork and stretching along the coast all the way to Connemara, where our trip ended, and beyond. But I wasn't here to eat... well, not just to eat. Nor was I here to relive my beer and marijuana-fueled trip in 1969 (to read about that trip, check out my blog). This time I was here as a guest of Fáilte Ireland -- a government organization that promotes tourism in Ireland -- to seek adventure, or at least what passes for adventure these days for a geezer like me. And I'm not talking about the adrenaline rush of driving down narrow country roads on the wrong side of the car and the wrong side of the road. The southwest coast of Ireland sort of looks like the toes of a misshapen foot with a misplaced big toe (the Ring of Kerry). As we drove in and out along the "toes" the views were astounding -- beaches, cliffs, picturesque villages and ocean panoramas. We stopped often to gawk. When we weren't gawking, eating or driving, we hiked -- in a sheep pasture on the Beara Peninsula, around Great Blasket Island off the coast of the Dingle Peninsula, through the rugged Gap of Dunloe to the Killarney Lakes, along the edge of the vertiginous Cliffs of Moher, and up about 1300 feet to the top of Diamond Hill with views of the crenulated coastline of moody Connemara in the distance. We enjoyed them all, but our favorite was on Inishboffin Island, also in Connemara, about a 30-minute boat ride from the fishing village of Cleggan. After 20 minutes or so of walking up one of the few roads on the island, we were almost completely alone except for sheep in the pastures. Soon we were on a long deserted beach that looked almost Caribbean. We hung out for a while, then skirted the edge of the empty cliffs as we headed back to the ferry dock for our return to Cleggan for mussels and oysters at a bar on the waterfront. They tasted as if they had been just plucked from the surrounding seas, which they probably were. Driving and hiking weren't our only adventures. On the first full day of our trip, we went on a two-hour night time kayak paddle on Lough Hyne near the town of Baltimore at the southwestern tip of the country. I've kayaked a fair amount over the years but had never done anything like this. For two hours we leisurely paddled and drifted around the lake listening to the sounds of the night and looking at the stars in the darkening sky. Bioluminescence sparkled in the ripples stirred by our paddles. Stars, sparkles and the hush of the Irish countryside -- it was a great way to begin our trip. A few days later, I climbed the exposed, steep, centuries-old stone stairs to the rocky remnants of the ancient monastery on the top of Skellig Michael, the largest of the Skellig Islands. One thing you can say about exposed, steep climbs is that the views are incredible. The other thing you can say is that you're crazy if you look. 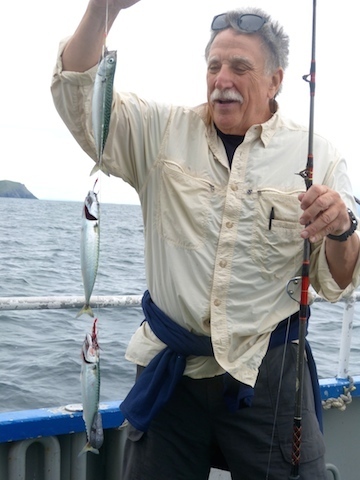 A couple of days after that, I was pulling slimy fish off hooks on a small boat pitching and rolling in Dingle Bay, fish that I would eat just a couple of hours later at a bar and restaurant across from the docks. While the food, music and scenery are fantastic, it's the people who make the country. I felt an instant connection with most everyone we met. With a twinkle in the eye and a lilt in the voice, they were welcoming, warm, and easy to talk to. Maybe it's the brogue, which is more musical and easier to understand than, say, the thicker accents of Scotland and the working class regions of England. Or maybe it's the Anglo-Saxon roots we share or the influence of Irish culture throughout the Western world. Whatever the reason, I often felt like I was talking with old friends. I'm inclined to think it's the innate playfulness of the Irish, or as Katherine describes it, "they're in touch with their inner leprechaun." I am not Irish, but I feel Irish in Ireland. Perhaps, it's my own inner leprechaun, a leprechaun who happens to like his oysters crisp, his mussels juicy, and his beer cool, dark and smooth.